It has no official website, no signs on the streets directing to it and no paved roads leading to it, but once you have reached your destination, you are magically transported into a world that not many people know exists. Located just off Arabian Gulf Road in the Sharq district of Kuwait in one of the very few surviving pre World War Two era structures in the old capital, the Modern Art Museum in Kuwait offers visitors one of the only permanent displays of modern Arab and international art in the region. This imposing building has always been an educational institution; it was built in 1939 to house the Madrasa Al Sharqiya, or Eastern School in which generations of prominent Kuwaitis studied including the current Emir Sheikh, Sabah Al Ahmad. When the National Committee of Culture, Arts and Literature took over the building two decades ago it went about carefully restoring it from the heavy damage incurred during the 1990 invasion and transforming it into a fitting home for its art collection comprised of purchases and donations. Photos of the restoration process, which lasted until 2003, can still be seen along with black and white pictures of students from the various classes. Upon arrival, a traditional wooden doorway leads visitors to an open air hoash or lobby that can be found in most large houses in the region where the museum administration offices are located. Then walking through a short corridor through a glass door the visitor passes the temporary exhibition hall where artists are invited to hold exhibitions of their latest works. Then another large lobby appears, this one covered in a transparent roof as beneath it dozens of sculptures dating back several decades are on display. This lobby is surrounded by several classrooms on the ground and first floors with large rectangular windows overlooking it, these classroms have now been transformed into art galleries divided into themes. The ground floor lobby along with the classrooms is dedicated exclusively to Kuwaiti art including paintings and sculptures by Essa Sagr, Khazal Al Gaffas, Sami Mohammed and Thuraya Al Baqsami who are counted amongst the pioneers of the modern art movement not only in Kuwait but also in the Arabian Gulf region. An elevator that looks as though it has come out of a Mahmoud Hammad painting transports visitors to the first floor where Gulf, Arab and international art can be admired including the UAE's Abdul Qader Al Rais who studied in Kuwait, Lebanon's Paul Guiragossian, Syria's Nazir Nabaa and Bahrain's Jamal Abdul Rahim offering a different perspective on various issues in the Arab world. There must be at least a couple of hundred artworks showcased in this magnificent museum that has so far received scant attention from the region's media. The Kuwait Modern Art Museum sadly offers very little explanation of the art on display and no book or audio guide, but it more than makes up for it for those who are willing to visit with an open mind and a little imagination allowing themselves to be enchanted by its unrivalled architectural, historical and artistic treasures. 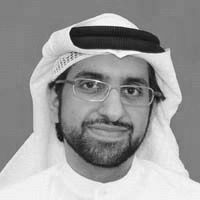 Sultan Sooud Al Qassemi is the founder of the Barjeel Art Foundation in Sharjah, UAE and the co-founder of the award winning Meem Gallery in Dubai, UAE.